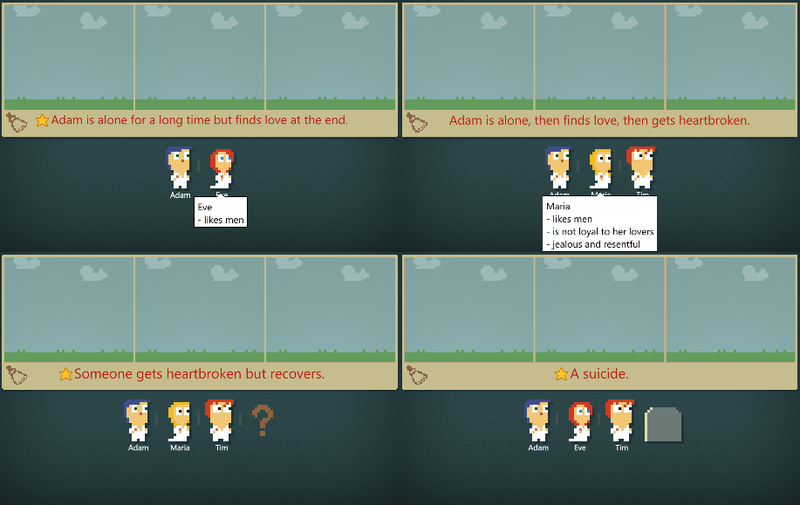 I made a small BETA of Storyteller recently for several friends, mostly game designers. Even though it's a lot less useful if I can't watch them play, the fact that they are smart designers means they can articulate what they believe needs improvement. I panicked a bit every time I received a mail because I had no idea what they would think of the game! It turns out the game is working a lot better now. However, this post is about one of the major remaining challenges of designing Storyteller. Storyteller "cartoonizes"  character behavior into a bunch of abstract logical rules that are displayed as pixelated dolls inside frames. What would happen if instead we make all the feedback abstract? Everybody starts playing Storyteller with preconceptions on how to read its visual narrative, how characters should react to situations and how to read facial expressions. This knowledge is essential to make Storyteller playable, but it's a double-edged sword because those preconceptions ALWAYS differ to some degree to how the game actually works. 1) Eve and Tim become rich, she picks Tim. 2) Hero gives his money to Eve who in turn gives it to her future lover. 3) Tim steals Eve's money and seduces her with it. Which interpretation is the right one? There's no "universal" set of rules that work equally for everybody . So over time I programmed the story simulator to pick a "best"  way to interpret these visual sequences, and use captions and character expressions and ingame tooltips to hint how the game actually works. My hope is that these elements, combined with good level pacing and effective feedback will "train" new players to see things the Storyteller way. However, this process is extremely fragile. If during the initial levels the game fails to adjust a "bad" player preconception, it will be carried over to the more challenging levels, where the player will feel the simulator is misbehaving : "Why is this character doing this? ", "I don't understand how this character is jealous now when he wasn't last time! ", etc. Until recently, I believed that even if a player doesn't get something initially he eventually will during the later levels, but my observations disprove it: once a misinterpretation settled, it's very hard to correct it, and playing becomes very frustrating. The hard part is that I noticed people have wildly different preconceptions of how Storyteller should work  and some people find the game very confusing while to others it makes sense right off the bat. When you reach the last level, you played with Maria twice, not Eve, so it is likely that you would confuse them! Of course, the challenge is not just how to expose the rules to the players, it's also about improving the rules themselves to make them easier to internalize, but it shows how important the beginning of the game is! by "cartoonize", I mean that many real-world complexities are reduced: love is a pretty sophisticated mechanism, but in Storyteller it's reduced to a few rules of the like "two available and compatible characters will fall in love", where with love as we know it there's many subtle factors involved. Likewise, details and subtlety are removed from traditional storytelling in order to make the game simpler to engage. and since the simulator is software, it has even less tools than a human being to make interpretations. It needs things to be unambiguous to be able to do its magic. the simulator rules try to be simple, easy to remember and as culturally universal as possible. when confronted with an abstract puzzle, we all accept the game's guidance because we are in unfamiliar territory, but when it comes to stories, we all consider ourselves experts!